In Gabrielle Bernstein's book The Universe Has Your Back: Transform Fear to Faith she talks about looking for signs from the Universe that you are on the right path. Specifically, she talks about looking for a new house and asking the Universe for a sign that this is it: an owl. So the next time she's at the mountain house she and her husband are considering, she looks everywhere for her sign. On books, pictures, even the dishware. She scours the house and finds nothing, only the dragonfly a friend mentioned was her friend's sign, on a gift card. She considers that a step in the right direction, but keeps looking for her owl. Later that day she and her husband stop in the local town, down the road from the mountain house. And when she gets out of the car...she spots her owl on the bumper of a car parked nearby. Woot! So, I was listening to this book on Friday of last week. Gabrielle suggests we pick a sign: don't over think it. Just whatever comes to mind. Immediately, the image of a butterfly popped into my mind's eye. My tribemates, you know quite well that butterflies are pretty special for me. When my grandmother passed away, I had a dream in which she told me to look for the butterflies. That they would be her checking in on me. Soooo, I've been looking for my butterfly sign to tell me I'm on the right path in my life. Is all this spiritual work, my Tarot reading, my meditation, my Reiki practice, energy work in general, my year of self-coaching before I put any more energy into anything else...am I on the right path? Or am I just being self-indulgent? I kept looking all day Friday. 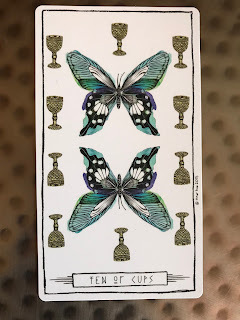 Then, Saturday afternoon, I was shuffling my Lumina Tarot deck after doing a reading for someone, and looking what fell into my lap. You know, one of those jumpers. Less than 24 hours after I asked for my sign. Mirror images! 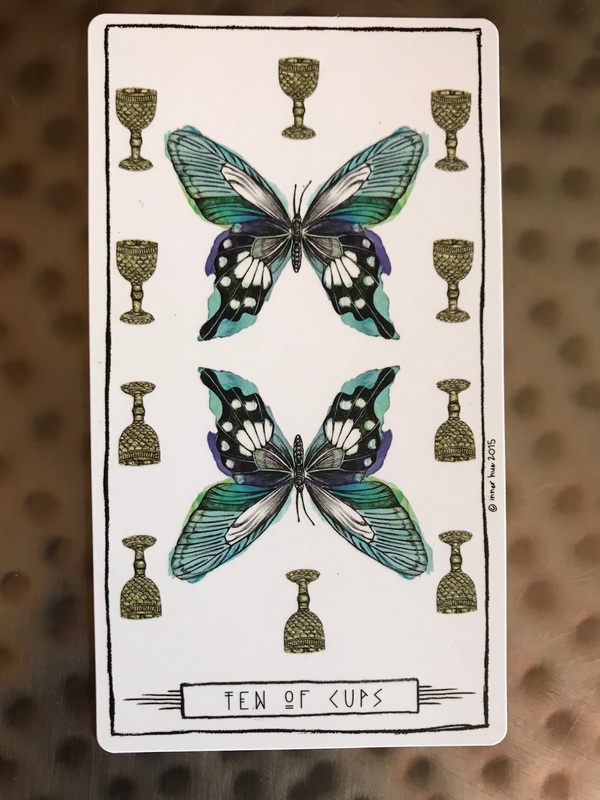 And on top of it all...it's the 10 of Cups. And this isn't the only synchronicity that's been happening. Or do you think the odds are ever in our favor for these "random" things to happen?